Property Profile: Step into your new home located in the gated Loomis Village community of Award Winning Spring View Farms. This family focused home has it all; beautiful craftsmanship, brilliant layout, custom built-ins, soaring vaulted ceilings and much, much more. The gorgeous gourmet kitchen has granite countertops, over-sized island with additional sink and suspended seating, high end commercial grade stainless steel appliances including two dishwashers, double ovens, extra large Thermador fridge and Wolf gas range. Walk-in pantry, breakfast area and built in homework station hug this dream kitchen. Multi-level windows allow natural light to pour in while offering stunning views of the, never to be built on, protected Jordan River wetlands. Upstairs, the master suite redefines luxury with its private deck and attached master bath complete with extra large vanity, double sinks, double shower heads, over-sized jetted tub and custom built walk-in closet. Additional second story bedrooms include custom murals, walk-in closets and built-in window seats with additional storage. Two of these rooms connect with a playful secret passageway. Journey to the basement via staircase or slide to find two additional bedrooms, full exercise room with surround sound, high end fans and wall to wall mirrors, craft room with center cutting island and cabinets, family game room and under the staircase “Diamond Mine”. This home’s showstopper is the 28 seat sound proof theater room! Pull back the curtain and enter this true movie theater experience with 7.1 surround sound, Sony projector and 144″ picture, auto reclining under lit seats, built in bar with beverage fridge and kids performance stage. All theater room equipment is included. Endless storage on every level, mudroom with custom lockers, extra wide and deep 6 car garage with two entrances leading back into the home with built-in shelving and a unique dog wash station! Backyard paradise for all ages capable of taking your breath away! 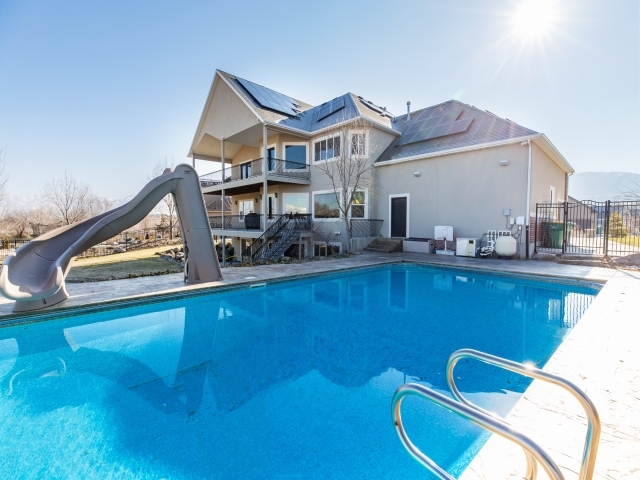 Three level deck with natural gas hookups and detailed railings overlook the heated Salt Water pool with deck jets, water slide, diving board and covered gazebo. This child’s dream of a yard also has a pirate ship themed play set and full sized doll-like playhouse. The well thought through conveniences to make family life easier have already been taken care of with a full security system, intercoms in every room, wet and dry central vac that reaches every square foot of the home even the garage, recirculating instantaneous hot water accessible from any faucet, two laundry rooms and solar panels reducing the electric bill to $8 per month. Separate furnace, humidifier, and A/C on each level. Call for or see a full list of amenities in MLS Attached Documents. Square footage figures are provided as a courtesy estimate only and were obtained from an Appraisal. Buyer is advised to obtain an independent measurement.